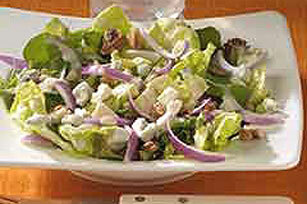 For this elegant salad, mixed greens, toasted walnuts, red onions and blue cheese are tossed in a creamy mustard dressing. You'll know it's a special occasion when you enjoy a serving of this salad. Prepare as directed, using GREY POUPON Savory Honey Mustard.